MSgt. Woodrow Wilson Keeble, USA. photo Vets Incorporated, Wahpeton, ND. Almost six decades after his actions, and 26 years after his death, today in the East Room of the White House, President Bush awarded the Medal of Honor to Msgt. Woodrow Wilson Keeble. The MOH was accepted by Keeble's stepson, Russell. 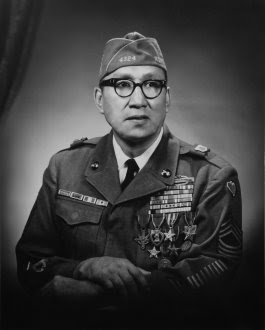 Keeble is the first full-blooded Sioux to receive the Medal of Honor. Keeble is one of the most decorated Soldiers in North Dakota history. A veteran of World War II and the Korean War, he was born in 1917 in Waubay, S.D., on the Sisseton-Wahpeton Sioux Reservation, which extended into North Dakota. He spent most of his life in the Wahpeton, N.D. area, where he attended an Indian school. In 1942 Keeble joined the North Dakota National Guard, and in October that year, found himself embroiled in some of the fiercest hand-to-hand combat of World War II on Guadalcanal. "Guadalcanal seemed to be on his mind a lot," Russell Hawkins, Keeble's stepson, said. "His fellow Soldiers said he had to fight a lot of hand-to-hand fights with the Japanese, so he saw their faces. Every now and then he would get a far-away look in his eyes, and I knew he was thinking about those men and the things he had to do." At Henderson Field on the South Pacific Island, Keeble served with Company I, 164th Infantry - the first Army unit on Guadalcanal. "I heard stories from James Fenelon, who served with him there, and he would talk about how the men of the 164th rallied around this full-blooded Sioux Indian whose accuracy with the Browning Automatic Rifle was unparalleled," Hawkins said. "It was said he would go in front of patrols and kill enemies before his unit would get there." The Sioux have a word for that kind of bravery, according to Hawkins - wowaditaka. "It means don't be afraid of anything, be braver than that which scares you the most." Keeble personified the word according to fellow Soldiers, and earned the first of four Purple Hearts and his first Bronze Star for his actions on Guadalcanal. Keeble answered the call to arms again when war broke out in Korea. He was a seasoned, 34-year-old master sergeant serving with 1st Platoon, Company G, 19th Infantry Regiment, 24th Division. According to eyewitness accounts, while serving as the acting platoon leader of 1st Plt. in the vicinity of the Kumsong River, North Korea, on or about Oct. 15. 1951, Keeble voluntarily took on the responsibility of leading not only his platoon, but the 2nd and 3rd Platoons as well. In an official statement 1st Sgt. Kosumo "Joe" Sagami of Co. G said, "All the officers of the company had received disabling wounds or were killed in action, except one platoon leader who assumed command of the company." The company's mission was to take control of a steep, rocky, heavily fortified hill. Hawkins recalled how the man everyone knew as "Woody," described the terrain. "We were driving through Colorado on a trip, and Woody was pointing at something out the window," Hawkins said. By that time, Keeble had suffered seven debilitating strokes and lost the ability to speak. "I pulled over and realized he was pointing at a large, rocky cliff with an almost sheer drop. I asked Woody if that was what it was like during that battle in Korea and he nodded, 'yes,'" Hawkins said. "It wasn't quite a straight drop down, but you could get up the hill faster on your hands and knees than on your feet." Sagami wrote that Keeble led all three platoons in successive assaults upon the Chinese who held the hill throughout the day. All three charges were repulsed, and the company suffered heavy casualties. Trenches filled with enemy soldiers, and fortified by three pillboxes containing machine guns and additional men surrounded the hill. Following the third assault and subsequent mortar and artillery support, the enemy sustained casualties among its ranks in the open trenches. The machine gunners in the pillboxes however, continued to direct fire on the company. Sagami said after Keeble withdrew the 3rd platoon, he decided to attempt a solo assault. "He once told a relative that the fourth attempt he was either going to take them out or die trying," Hawkins said. "Woody used to tell people he was more concerned about losing his men than about losing his own life," he added. "He pushed his own life to the limit. He wasn't willing to put his fellow Soldiers' lives on the line." Armed with grenades and his Browning Automatic Rifle, Keeble crawled to an area 50 yards from the ridgeline, flanked the left pillbox and used grenades and rifle fire to eliminate it, according to Sagami. After returning to the point where 1st Platoon held the company's first line of defense, Keeble worked his way to the opposite side of the ridgeline and took out the right pillbox with grenades. "Then without hesitation, he lobbed a grenade into the back entrance of the middle pillbox and with additional rifle fire eliminated it," Sagami added. Hawkins said one eyewitness told him the enemy directed its entire arsenal at Keeble during his assault. "He said there were so many grenades coming down on Woody, that it looked like a flock of blackbirds." Even under heavy enemy fire, Keeble was able to complete his objective. Only after he killed the machine gunners did Keeble order his men to advance and secure the hill. "When I first started hearing these stories I was amazed that a man of Woody's size (more than six feet tall and 235-plus pounds), could sneak up on the enemy without being noticed," Hawkins said. "So one day, I was out helping him mow the lawn, and I asked him how he did it. He just shrugged his shoulders. "I joked with him and told him those soldiers must have been blind or old or something, because he would never be able to sneak up on a young guy like me." Hawkins said he continued to mow then was startled when Woody popped up from behind some bushes near him. "He could have reached out and grabbed me by the ankles, and I didn't even know he was there!" Keeble had slid on his back behind the brush. Although Hawkins was not positive, he believed Keeble might have used a similar maneuver when attacking the pillboxes. Keeble's selfless acts on that rugged terrain in 1951 did not come without a price. According to Sagami and other eyewitnesses, he was wounded on at least five different occasions by fragmentation and concussion grenades. "His wounds were apparent in the chest, both arms, right calf, knee and right thigh and left thigh." Sagami cited blood at the wound locations as evidence. Hawkins said 83 grenade fragments were removed from Keeble's body, but several others remained. "You could tell that the wounds bothered him sometimes, but he never complained." Sagami wrote in his statement that Keeble did not complain on the battlefield either. "At no time did he allow himself to be evacuated during the course of the day. Only after the unit was in defensive positions for the night did he allow himself to be evacuated." THE PRESIDENT: Welcome. Thanks for coming. Mr. Vice President, Mr. Secretary, members of the Dakotan Congressional Delegations, Senator from Alaska, other members of Congress, Members of my Cabinet, members of the administration, members of the United States Armed Forces, distinguished guests: Welcome to the White House. The Medal of Honor is the highest award for valor a President can bestow, and I'm honored recipients of the Medal of Honor have joined us. Thank you for coming. During my time in office, I've had the privilege of performing this duty on nine separate occasions. Every ceremony has been inspiring. Many have been joyful. Some have been poignant. But I'm not sure I can remember many ceremonies quite like this one. It's taken nearly 60 years for Master Sergeant Woodrow Wilson Keeble to be awarded the medal he earned on the battlefield in Korea. His nominating paperwork was lost, and then it was resubmitted, and then it was lost again. Then the deadline passed, and Woody and his family were told it was too late. Some blamed the bureaucracy for a shameful blunder. Others suspected racism: Woody was a full-blooded Sioux Indian. Whatever the reason, the first Sioux to ever receive the Medal of Honor died without knowing it was his. A terrible injustice was done to a good man, to his family, and to history. And today we're going to try to set things right. Few people worked harder for this day than Woody's family. I thank the members who are with us, including his son, Russell, who is accepting this award on their behalf, along with his cousin -- a cousin. THE PRESIDENT: Along with his nephew. I want to welcome you here. Thank you for supporting Woody. Thank you for your understanding, your patience and, most of all, your persistence. I also offer special thanks to the determined delegations of North and South Dakota, including the Governor of North Dakota and the former Governor of South Dakota. Woody had ties to both Dakotas. Each state claims him as its own. (Laughter.) I think I'm going to stay out of the argument. I want to thank you for carrying Woody's banner to the Pentagon, and to the halls of Congress. You did the right thing. It's easy to understand why so many people argued so passionately for the Medal once you hear the story of what Woody Keeble did. This story unfolded at an important time in our history. The year was 1951. The world was divided by a Cold War. America was under threat and -- some believed -- overmatched and out of heart. The great evil of communism was said to be the future of the world. It was on the advance in Europe, and in China, and on the Asian peninsula of Korea. On that peninsula, a battle raged between communist forces in the North and the forces of freedom in the South. And Woody Keeble, a decorated veteran of Guadalcanal, raised his hand to serve his country once again. Woody said he volunteered for Korea because, "somebody has to teach those kids how to fight." And that's exactly what he did. In George Company, he quickly became a mentor, a teacher, and a legend. He was so strong that he could lift the back of a jeep and spin it around. Some people knew he had been scouted by the Chicago White Sox. He had a heck of an arm, and he threw grenades like a baseball. One soldier remembered the time Woody walked through a mine field, leaving tracks for his men to follow. Another recalled the time Woody was shot twice in the arm and he kept fighting, without seeming to notice. That fall, Woody's courage was on full display during a major offensive called Operation No Man [sic]. His company was ordered to take a series of hills protecting a major enemy supply line. High up in those hills and manning machine guns were Chinese communist forces. After days of fighting, the officers in Woody's company had fallen. Woody assumed command of one platoon, then a second, and then a third, until one of the hills was taken, and the enemy fled in wild retreat. That first advance nearly killed him. By the end of the day, Woody had more than 83 grenade fragments in his body. He had bleeding wounds in his arms, chest, and thighs. And yet he still wanted to fight. So after a day with the medics, he defied the doctor's orders and returned to the battlefield. And that is where, on October 20, 1951, Master Sergeant Woodrow Wilson Keeble made history. Communist forces still held a crucial hill that was the "pearl" of their defenses. They had pinned down U.S. forces with a furious assault. One soldier said the enemy lobbed so many grenades on American troops that they looked like a flock of blackbirds in the sky. Allied forces had tried heavy artillery to dislodge the enemy, and nothing seemed to be working. The offensive was failing, and American boys were dying. But our forces had one advantage: Woody was back, and Woody was some kind of mad. He grabbed grenades and his weapon and climbed that crucial hill alone. Woody climbed hundreds of yards through dirt and rock, with his wounds aching, bullets flying, and grenades falling all around him. As Woody first started off, someone saw him and remarked: "Either he's the bravest soldier I have ever met, or he's crazy." Soldiers watched in awe as Woody single-handedly took out one machine gun nest, and then another. When Woody was through, all 16 enemy soldiers were dead, the hill was taken, and the Allies won the day. Woody Keeble's act of heroism saved many American lives, and earned him a permanent place in his fellow soldiers' hearts. Years later, some of those tough soldiers' eyes would fill with tears when they saw Woody again. One said: "He was the most respected person I ever knew in my life." Another said: "I would have followed him anywhere." A third said: "He was awesome." Those brave boys battled tyranny, held the line against a communist menace, and kept a nation free. And some of them are with us today. We are honored to host you at the White House. We thank you for your courage. We thank you for honoring your comrade in arms. And we thank you for your service to the United States. As the war ended, Woody went back to North Dakota. In some ways, his return was a sad one. Within a few years, his first wife died. He would suffer from numerous affects of the war. A series of strokes paralyzed his right side and robbed him of his ability to speak. And the wounds he sustained in service to his country would haunt him for the rest of his life. In his community he was an everyday hero. Even in poor health, he would mow lawns for seniors in the summers and help cars out of the snow banks in the winters. He once picked up a hitchhiker who was down on his luck and looking for work. Woody wasn't a rich man, but he gave the man $50. Those who knew Woody can tell countless stories like this -- one of a great soldier who became a Good Samaritan. To his last days, he was a devoted veteran. He proudly wore his uniform at local events and parades. Sometimes folks who loved him would see that uniform and ask him about his missing medal. They felt he was cheated, yet Woddy never complained. See, he believed America was the greatest nation on Earth, even when it made mistakes. And there was never a single day he wasn't proud to have served our country. Woody suffered his eighth -- and final -- stroke in 1982. His son, Russell, took him to the hospital and prayed it wasn't the end. But Woody knew, and he wasn't afraid. Woodrow Wilson Keeble died in graceful anonymity, unknown except to the fortunate souls who loved him, and those who learned from him. Russell put it this way: "Woody met death with a smile. He taught me how to live, and he taught me how to die." I am pleased that this good and honorable man is finally getting the recognition he deserves. But on behalf of our grateful nation, I deeply regret that this tribute comes decades too late. Woody will never hold this Medal in his hands or wear it on his uniform. He will never hear a President thank him for his heroism. He will never stand here to see the pride of his friends and loved ones, as I see in their eyes now. But there are some things we can still do for him. We can tell his story. We can honor his memory. And we can follow his lead -- by showing all those who have followed him on the battlefield the same love and generosity of spirit that Woody showed his country everyday. At the request of the Keeble family and in accordance with the Sioux tradition, two empty chairs have been placed on this stage to represent Woody and Blossom and to acknowledge their passing into the spiritual world. The Sioux have a saying: "The life of a man is a circle." Well, today, we complete Woody Keeble's circle -- from an example to his men to an example for the ages. And if we honor his life and take lessons from his good and noble service, then Master Sergeant Woody Keeble will serve his country once again. I want to thank you all for coming. May I ask for God's blessings on you and Woody Keeble and the Keeble family. May God continue to bless our country. And now I ask Mr. Hawkins and Mr. Bluedog to join me. Commander Thompson will read the citation. In action with an armed enemy near Sangsan-ni, Korea, on 20 October, 1951. On that day, Master Sergeant Keeble was an acting platoon leader for the support platoon in Company G, 19th Infantry, in the attack on Hill 765, a steep and rugged position that was well defended by the enemy. Leading the support platoon, Master Sergeant Keeble saw that the attacking elements had become pinned down on the slope by heavy enemy fire from three well-fortified and strategically placed enemy positions. With complete disregard for his personal safety, Master Sergeant Keeble dashed forward and joined the pinned-down platoon. Then, hugging the ground, Master Sergeant Keeble crawled forward alone until he was in close proximity to one of the hostile machine-gun emplacements. Ignoring the heavy fire that the crew trained on him, Master Sergeant Keeble activated a grenade and threw it with great accuracy, successfully destroying the position. Continuing his one-man assault, he moved to the second enemy position and destroyed it with another grenade. Despite the fact that the enemy troops were now directing their firepower against him and unleashing a shower of grenades in a frantic attempt to stop his advance, he moved forward against the third hostile emplacement, and skillfully neutralized the remaining enemy position. As his comrades moved forward to join him, Master Sergeant Keeble continued to direct accurate fire against nearby trenches, inflicting heavy casualties on the enemy. Inspired by his courage, Company G successfully moved forward and seized its important objective. The extraordinary courage, selfless service, and devotion to duty displayed that day by Master Sergeant Keeble was an inspiration to all around him and reflected great credit upon himself, his unit, and the United States Army. Video available at The White House site. One of my drill sergeants holds the Medal. SSG Patterson went on to become a Command Sergeant Major, but more than any of my other Drills, I never forgot him. Quiet, unassuming, and what he told you to do, you just did it. We didn't even know he had the Medal till the last night, when our Senior Drill told us and explained what it meant. We were boys; we didn't really understand. Here's to you, MSgt. Keeble. Thank you for your service.